The Big Wobble: Only 29 "confirmed" eruptions were recorded in 2017 the lowest count this century mirroring the lowest major quake total! A little weird? 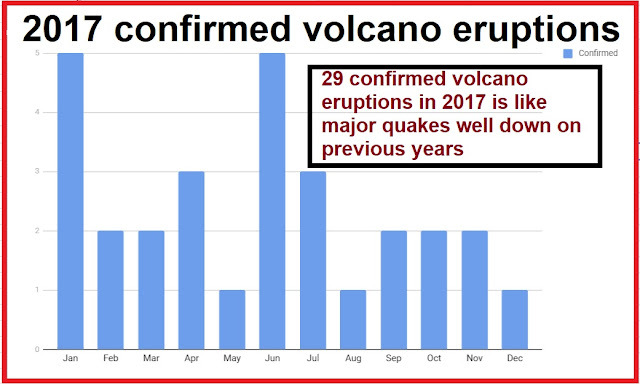 Only 29 "confirmed" eruptions were recorded in 2017 the lowest count this century mirroring the lowest major quake total! A little weird? It's incredible after all the reports I post per year of volcanic activity and eruption alerts that only 29 "confirmed" eruptions were recorded in 2017 but that is a fact according to the Smithsonian Institute the USGS of volcanoes. 2017's total of 29 was 15 less than 2016's 44, 14 less than 2015's 43 and 9 less than 2014's 38. Around 40 confirmed eruption is a yearly average in the 21st century with totals remaining pretty stable through the first 16 years with, just as with major quakes an unaccountable large drop-off in 2017. Just as the major quake total of 2017 was the lowest this century, the confirmed eruption total for 2017 is the lowest number this century too, the highest being the 2004 total of 49. It is, in my humble opinion, an incredible coincidence that in these volatile times (when everything is increasing) both major quakes and confirmed volcanic eruptions have the lowest number of the century in 2017 considering the massive increase in major quakes and volcano eruptions since the turn of last century, are we missing something here? 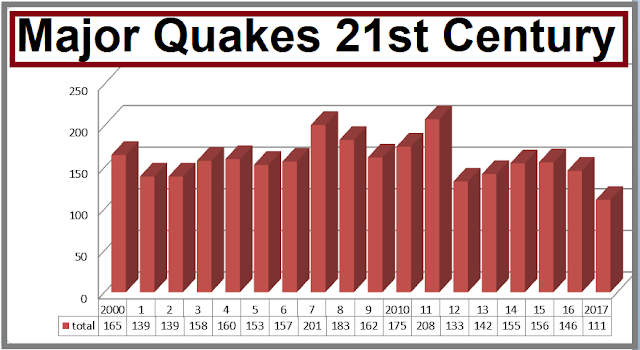 According to USGS statistics, major quakes have increased by more than 200% since 1900 with the volcano activity graph showing the same trend, for both to suddenly drop to the lowest total of the century on the same year is, excuse my grammar, weird! It's like the groans and grumbles of a man clenching his teeth and gripping his abdomen before the big explosion comes out his backside. Unless those statistics are total BS. Well the expansion, for the most part is free to move without much major problems from plate to plate. By this I mean warming has expanded the planet and has unlocked most of the plates. Floating more freely and ever separating, or plunging. Now being unlocked, they can move with little worry of largest quakes or the most violent eruptions. The earth crusts, all unlocked, and able to rise as the earth expands due to warming. I think you're way low on your "confirmed" count (and you don't explain how this "confirmation" works). By my count we had at least 92 eruptions. My "confirmed" eruptions come from the Smithsonian Institute, nothing to do with me to be honest, I would claim many more but hey, who am I?